Coweta STEM Institute | Engaging Coweta in STEM since 1990! Our Vision is to promote interest and enthusiasm in science and the technologies, particularly among elementary and middle school teachers and students… to encourage females and minorities to enter science and technology fields… to help U.S. students become the first in the world in science and math… and to prepare better qualified workers for our nation’s industries. -Providing hands-on workshops for teachers with complete lesson plans and many materials. Most workshops offer PLU credit for teacher recertification. -Assisting teachers with integrating technology into their teaching and into student-directed activities. -Providing hands-on science field trips based on Georgia GPS objectives for 15,000 students, K through 5th grades, each school year. -Providing summer science camps or computer camps for students in Coweta and surrounding counties. -Sponsoring science fairs, Science Bowls, Science Olympiads, and other similar competitions and special events. 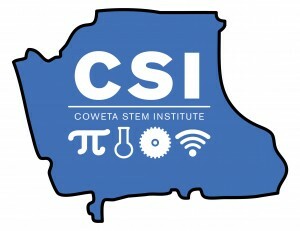 Coweta STEM Institute is a non-profit partner of the Coweta Community Foundation. By supporting the Coweta Community Foundation, you are supporting CSI too!